When Ruth Ann (Roo) McCabe responds to a text message while she's driving, her life as she knows it ends. The car flips, and Roo winds up in a hospital bed, paralyzed. Silent. Everyone thinks she's in a coma, but Roo has locked-in syndrome -- she can see and hear and understand everything around her, but no one knows it. She's trapped inside her own body, screaming to be heard. On a cold and icy day Roo receives a text message from her sister, Tilly, frantically telling her to come and pick her up. Roo's eyes wander off the road and onto her phone to reply to her sister. Simultaneously her concentration is disrupted and she swerves off the road. The car flips. The air is silent. One family's life is changed forever. It's time to take a second to realize that there are more important issues in YA than breaking up with your boyfriend or failing in school. Tilly faces the danger of possible losing her sister to a fatal brain/mental injury caused by the car accident. What's worse is that Tilly might have been the one that caused the accident to happen in the first place. If she hadn't sent that text message , none of this would have happened. Roo would have been fine and Tilly wouldn't be filled with grief. Rice's writing style is super super simple. Rice doesn't linger in the world of complex language and her writing isn't metaphor/simile riddled. I was so ticked off because, for some reason, this book couldn't hold my attention. Because of the simple writing style, I was expecting myself to fly through it. It took me a week to read it, and I didn't feel an overwhelming adoration soon after. On the bright side, however, the story was true and authentic and respectfully paid a homage to most relationships between sisters. I hate how some books make sibling rivalries worse than they actually are. They abuse the power of their words and scorn people's views on how siblings treat each other. It's not all black and white. When Roo is diagnosed with locked-in syndrome, Tilly realizes that she would do anything to have her sister say at least one word to her and just explain herself; how she didn't mean to text her while she was driving. I loved the jealousy between the two sisters when Roo realized that her boyfriend had been getting closer with her sister while she was immobile and her sister was able to talk and hug him. She starts to get so angered by her sister because she was technically the one that caused it and now Roo is the one that can't move and Newton is falling for her sister. Tilly had nearly killed me, and now she was stealing my boyfriend. For the first time since my accident, I really thought about giving up. I thought it would be easier to just die. I felt pretty indifferent about most of the characters. The only person I felt sorry for was Roo but at the same time, I was so pissed off at her for making some blind choices. Yes, Roo was trapped in her own body (god, she had my pity) but I couldn't find myself feeling extremely sorry for someone who would make choices with her knee instead of her head. This book brings on such an important message. One I think is extremely imperative due to the circumstances of how large of an influence technology and cellphones play in our everyday lives. Taking your eyes off of the road for one second can have a catastrophic impact on not only your life, but someone else's. In short, don't mess around when you're driving. 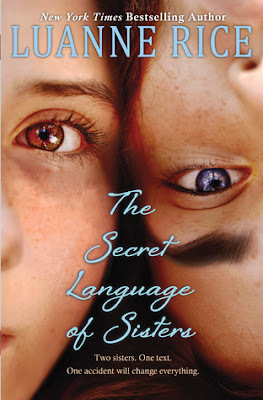 The Secret Language of Sisters is a hit or miss for most people. You're either going to really like it or really dislike it. I very much enjoyed this provoking novel. It's just like reading a book about animal cruelty and wanting desperately to become a vegan after reading it. After finishing this book I know that I've been changed for life. I won't allow phones and texting to claim the lives of me and my family and anyone else we put in danger. Visit ItCanWait.com for more information.